The Sale that you’ve been waiting for. – Filhome Builders Center Inc. The Sale that you’ve been waiting for. It’s time to upgrade your door into a modern luxury type. It can contribute to the appearance and character of your entire house with our sophisticated design at a lower cost. 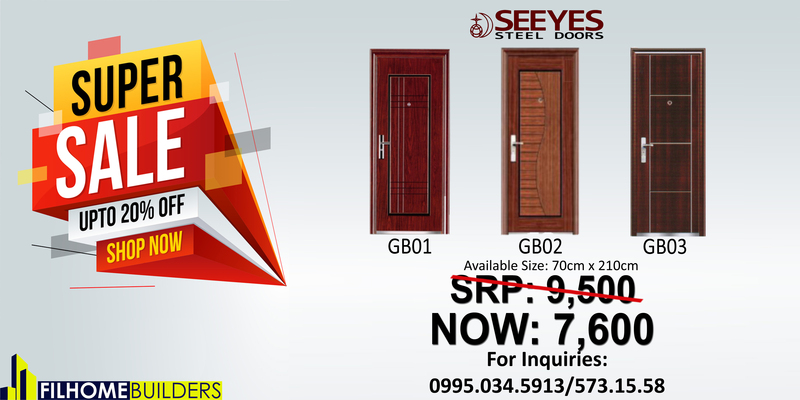 ➡️ Extra thick door leaf and special multiple burglar-proof structure design which guarantees a pry-proof function. ➡️ 3-pc cylindrical lock bolt, additional 2-pc ring bolts on the upper and lower frame, an overhead bolt and a foot bolt which guarantees ultimate security. ➡️ Comes with a luxury camber doorframe in a wooden finish. ➡️ Hinges are made from a stainless steel material and can easily open to 90 degrees. ➡️ Comes with a mortise-type handle set. ➡️ All copper door viewer that has a panoramic view. This entry was tagged limited time, Sale, steel door. Bookmark the permalink.